Our resources are at your service, according to your needs. Client satisfaction is the best reward for every day work. 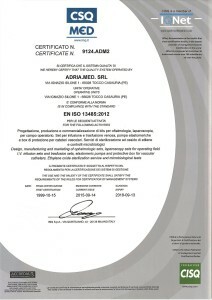 Adriamed has made of its technical-productive capacity and its continuous strategic choice of innovation, a fundamental cornerstone which has brought it to marketing the offer of a vast range of medical systems and a service which, for critical processes such as Ethylene oxide sterilization, is capable of satisfying the requirements of the most demanding client. 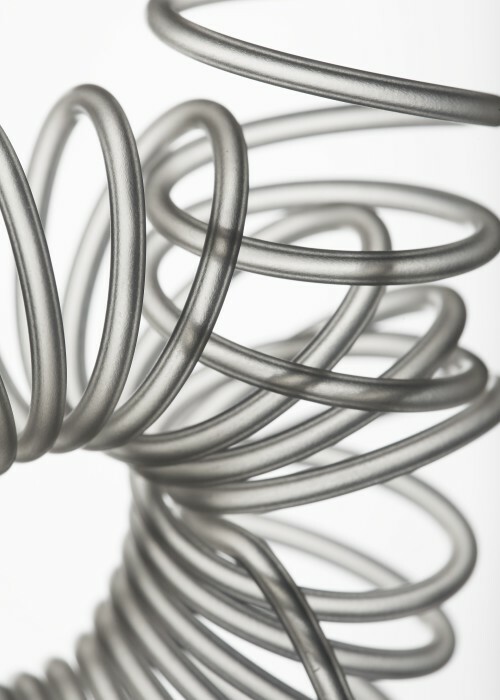 Research and development of specific applications, flexibility, widespread personalization of the product united with the production process which carries raw materials through to sterilization, and after-sales service, all make up Adriamed’s points of strength. 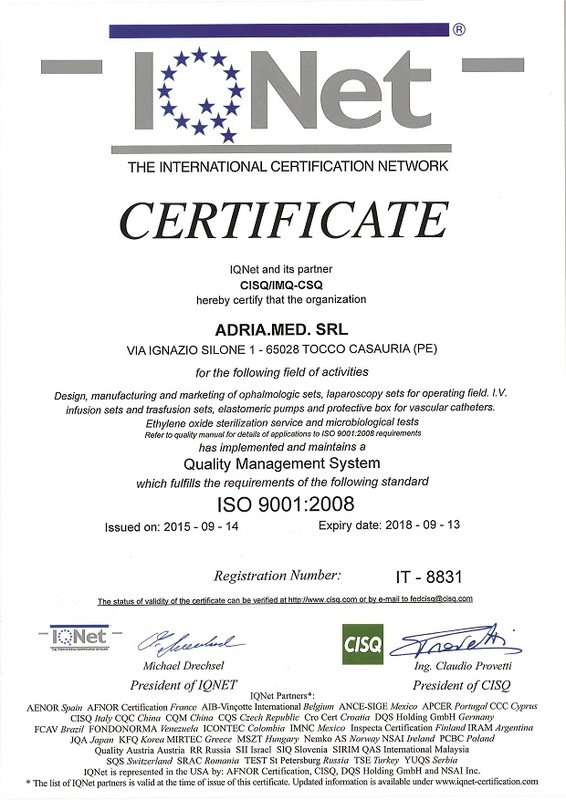 Over time, Adriamed has continuously improved the features of their products, ensuring conformity with the most restrictive of those standards which govern production in the medical sector. Adriamed is UNI EN ISO 9001:2008, EN ISO 13485:2012, UNI EN ISO 11135-1:2007 certified. A long history borne of a great passion. 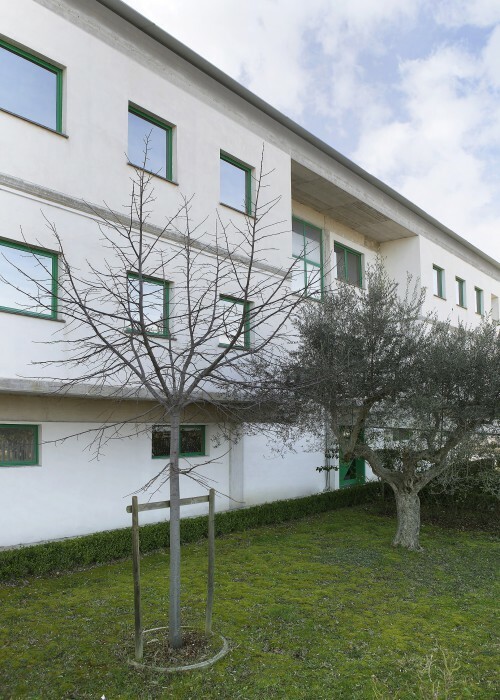 The story of Adriamed starts with a “great passion” when, in 1990, Armando Di Florio, entrepreneur already with 20 years’ experience in manufacturing single-use medical surgery devices in plastic, decided to commit himself to building a new establishment for the production of medical articles in the industrial area of Tocco da Casauria, in the province of Pescara. 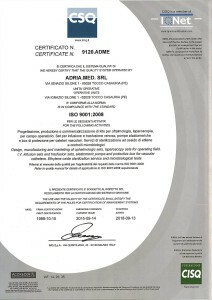 In 1999, in anticipation of its time, Adriamed obtained the first UNI EN ISO 9002 and UNI CEI EN 46002 certification, relating to the production of single-use, plastic, sterile and non-sterile, medical devices. Furthermore, they obtained the first important EEC certificate issued by IMQ for infusion and transfusion lines. 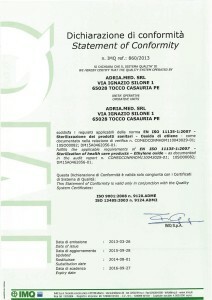 Over a full 20 years of history, many other products with EEC certification followed, being distributed over the Italian and European market. 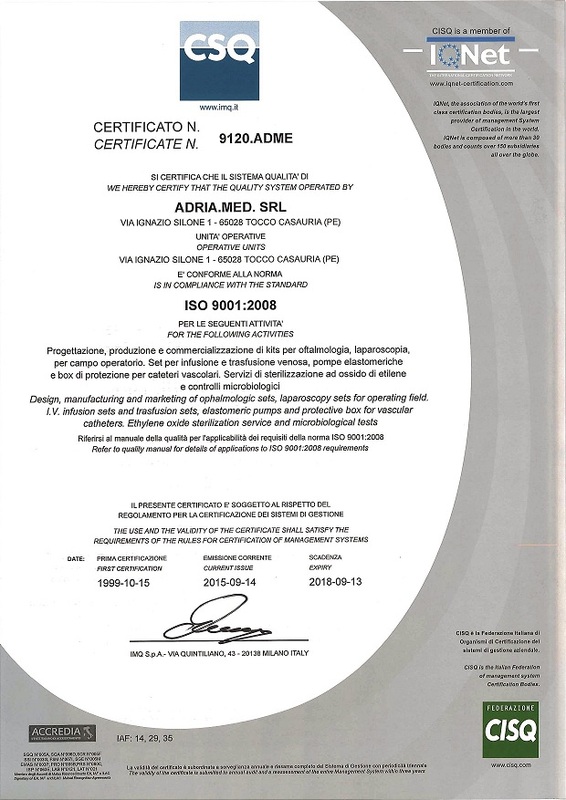 In 2003, Adriamed became certified with regard to the ISO 9001:2000 standard (Vision 2000), including preparing the ground for company certification. Production, initially carried out in 2 bare rooms, is now shared between 4 environments over a total of 500 m2 of contamination controlled space, all conforming with ISO 8 standards. In 2005, the Ethylene oxide sterilization centre was born as well as the company laboratory for technological and micro-biological monitoring. 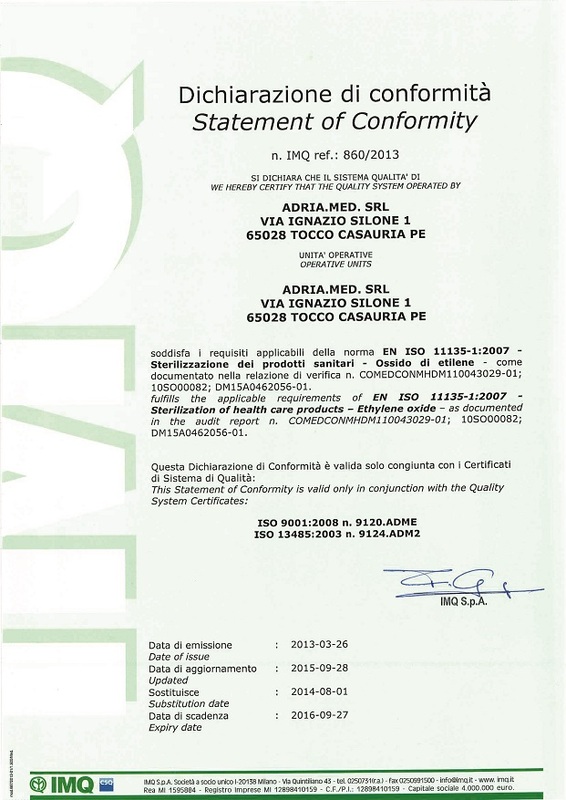 Adriamed also became certified for the sterilization service and internally executed micro-biological control. Currently, Armando Di Florio is still the sole director of the company, surrounded by a competent and close-knit staff who believe in achieving common objectives and who work in complete synergy. 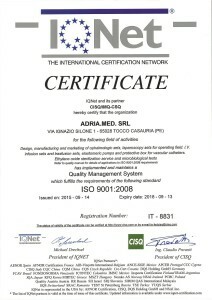 Adriamed became certified with regard to the ISO 9001:2000 standard (Vision 2000), including preparing the ground for company certification.